For the last week, I had planned to write the introduction to my next book. I had the whole thing outlined, and I knew what I wanted to cover in the opening pages. Each day I asked God to give me the right words, but nothing came. Inspiration eluded me. So instead of working on that book, I worked on another one. 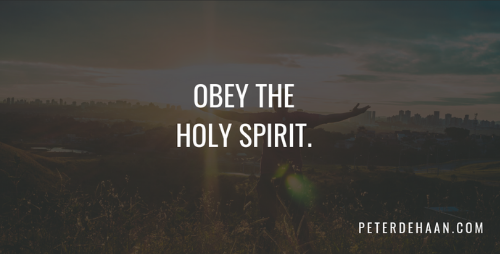 Yesterday morning, during my morning exercise ritual, part of which includes praying, one of my topics for the day was to “Pray for Holy Spirit inspiration.” I prayed. The words for my uncooperative introduction flooded into my mind. I know from experience that I must capture them immediately or they will quickly fade, eventually disappearing altogether. I stopped exercising at that moment and sat down in front of my computer. I wrote for the next hour. With my introduction finished I resumed exercising. I learned the hard way that when I’m inspired to write something—whether directly from the Holy Spirit or indirectly—I must write immediately. If I don’t, I will lose those words and inspiration. And they may not return. The Holy Spirit is my writing muse, and I must not ignore him. Yet the Holy Spirit speaks to me at other times too. Sometimes this is insight for me or to share with another. Other times it’s something I must do. To my discredit, I’m not always so quick to jump when the Holy Spirit gives me direction. At times I question his words because they make no sense to me, and he needs to tell me twice—sometimes three times. Then I act. When the Holy Spirit tells me to write, I learned I must do so and do so immediately. I wish I could respond just as quickly when he tells me to do other things. May I learn to do so and learn quickly. The Holy Spirit is certainly a creative muse. I should hope she is the Spirit that gives you the fresh fragrance of the Resurrection and annoints your spirit and sets it on fire for the glory of God preaching the Gospel… that humanity is created in God’s image and likeness male and female. Yes, Linda, I see the Holy Spirit as the source of my inspiration and creativity.